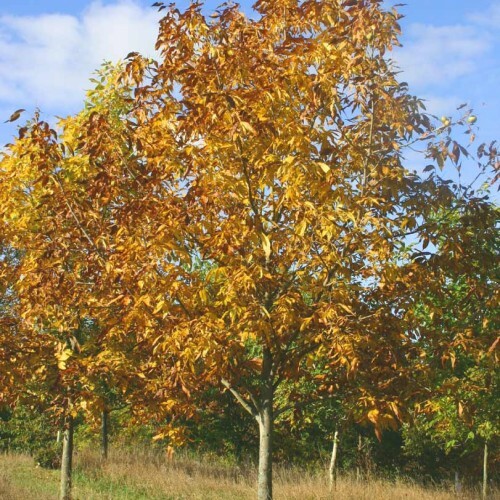 Shellbark Hickory is one of the easiest hickories to grow in a variety of soils and climates. Our plantings began by collecting seed from certain selections from Iowa, Illinois and Michigan. I was fortunate to meet a number of hickory enthusiasts who told me that planting seeds was the best way to grow the tree-to increase the diversity found within this large nutted selection. 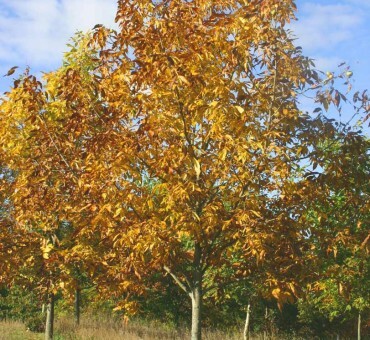 Our Ecos selection of shellbark represent some of the most productive trees along with some large nutted selections all grown at our farm. Many of these trees took 20 years to come into production although a few fruited in 10 years. Patience is the key. The trees are vigorous and easy to grow reaching 10 ft. tall in 5 -7 years. Fruiting occurs once they reach 2-4 inches in caliper. Plant two for pollination on this species. Our trees are grown in 10 inch deep pots on a mat of copper to slow tap rootedness. These will transplant very easy and work well for fall planting. Hardy to -25 F or more. Full sun, light shade ok. Grows 2-3 ft. once established. Good in wet or dry soils, with clay or loam.